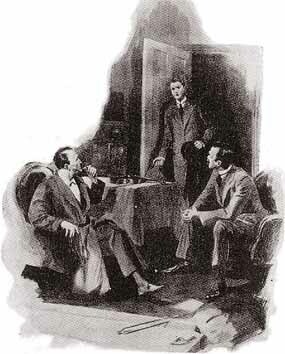 “Hardly enough, Mr. Holmes!” the old man cried in a high screaming voice, with extraordinary malignancy upon his face. He got between us and the door as he spoke, and he shook his two hands at us with furious passion. “You can hardly get out of it so easily as that.” His face was convulsed, and he grinned and gibbered at us in his senseless rage. I am convinced that we should have had to fight our way out of the room if Mr. Bennett had not intervened. HIS FACE WAS CONVULSED AND HE GRINNED AND GIBBERED AT US IN HIS SENSELESS RAGE. Sulkily our host–if I may call him so–cleared the path to the door. We were glad to find ourselves outside the house and in the quiet of the tree-lined drive. 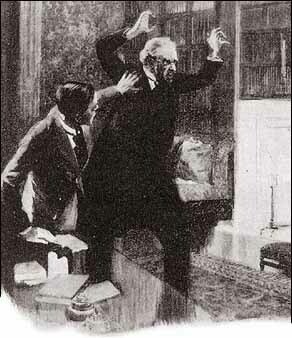 Holmes seemed greatly amused by the episode. Mr. Bennett pushed his way through some shrubs, and we had a view of the side of the house. “I could not climb it myself,” said Mr. Bennett.